Events may now be designated as All Day Events by clicking a new checkbox on the Scheduled Start field. All day events are displayed appropriately in the automated newsletter, event reminders, invitations, and iCalendar subscriptions. 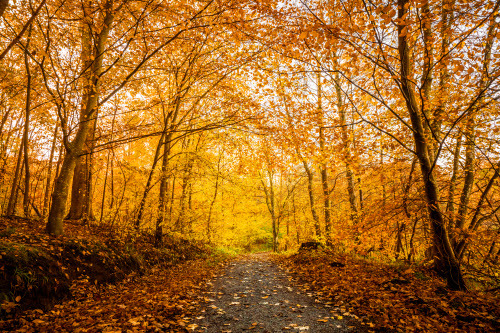 The Scheduled End date now defaults to the Scheduled Start date when entering a new event. Email recipients with blocked e-mail addresses are now highlighted on the e-mail confirmation page. View the most recent TroopWebHost Enhancement requests from a new tab, and see how your unit voted on each request. Troop 336 of Keller, Texas! Their striking banner image is sized wide enough to fill the width of a 1080p monitor and works well with the grey color scheme they selected. There's a lot going on on their home page, with an 8-day weather forecast and the weekend camping colors. The Visitors page has a map of their meeting location and an informative article on how Webelos should choose their troop. 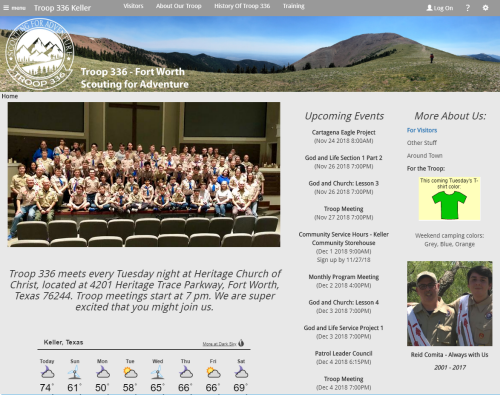 The About Our Troop uses widgets to display current information about the troop and the Training page shows this year's training opportunities. The Video Gallery has a good BSA video on orienteering, plus a couple of interesting time-lapse photography videos of troop events.